Talent has a way of running in families; for example, when we say "Bach," we usually mean Johann Sebastian, but at one time, in the region that one day would become what we know as Germany, so many members of the Bach family were engaged in music that the name "Bach" was a generic term for a town musician, even when not necessarily a relation! You probably knew that. What may not be as familiar, however, is that numerous artists who made records during the 78 RPM era had offspring or relations of a thespian inclination who made their mark in drama, in the cinema, or on television. I thought it might be fun to mention a few. Leo Slezak, (1873-1946) Moravian operatic tenor, sometimes called "The German Caruso." 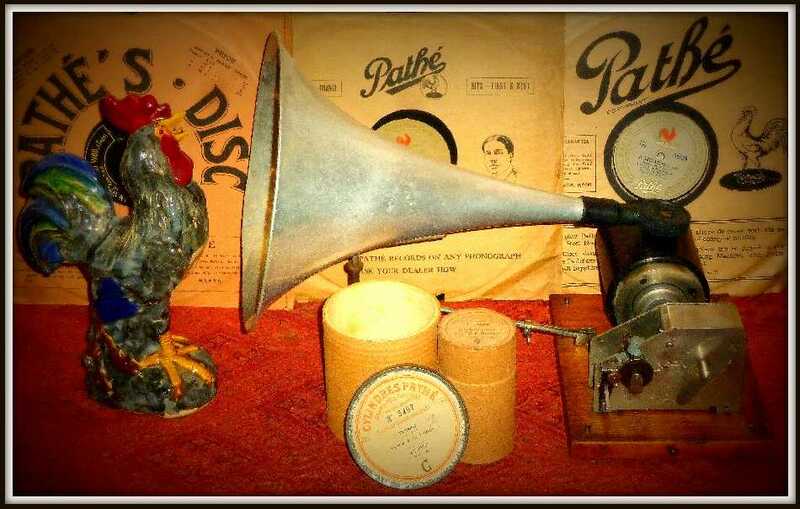 A front rank star of the operatic stage and a prolific recording artist in the interwar years, he can be heard on cylinders and acoustic and electric 78 RPM disks. He was responsible for my favorite account of "E Lucevan le Stelle" from Puccini's Tosca, issued as Edison 4-minute cylinder 28146. Now, he himself set the stage, so to speak, for his descendants, as beginning as early as 1932 he began appearing in German language movies, and those descendants certainly followed with enthusiasm. Son Walter Slezak was an immensely successful character actor first in Germany and then in Hollywood, with more than 100 films to his credit, and also participated in radio theater; appeared on Broadway, with a 1955 Tony Award for his role in the show Fanny; and had roles in television programs, including as the villain The Clock King on the cult hit Batman. Leo Slezak's daughter Margarete was also successful in cinema, but her career was in German films. Walter's daughter, Leo's granddaughter, Erika Slezak, after a start in legitimate theater, from 1971 to 2011 and again in an online version in 2013 was a fixture on the American television soap opera One Life to Live, in which capacity she won six Daytime Emmy Awards. Efrem Zimbalist (1889 or 1890 to 1995), Russian-born violin virtuoso of international renown, was himself an example of "talent runs in families," as his father was an orchestra conductor. After studies with celebrated violinist and pedagogue Leopold Auer in St. Petersburg, Zimbalist toured throughout the world and eventually settled in the United States, where he became the director of the Curtis Institute of Music. Unusually for a violinist of that rank in his generation, he was a champion of early music as well as the core Romantic repertory; he and his violinistic peer Fritz Kreisler made the first recording of Bach's concerto for two violins in 1915 for American Victor. That recording features a string quartet in accompaniment, and the performance style is definitely of the 19th century, with huge helpings of portamento in the slow movement. Definitely not how we would hear it played today! Zimbalist married another artist of the front rank, Romanian-born American soprano Alma Gluck (1884-1938). She had a career at New York's Metropolitan Opera, but her principal activity was as a highly successful concert singer and recording artist; her Victor record of James Bland's "Carry Me Back to Old Viginny" is often cited as the first million-selling Red Seal record. Now enter the thespian connection. Zimbalist and Gluck's son, Efrem Zimbalist, Jr., began in the theater as a stage actor and producer, in the latter capacity successfully bringing Gian Carlo Menotti's Pulitzer Prize-winning The Consul to Broadway. From there he moved into television, appearing in a heavy schedule of programs and most famously starring in the nine-season run of The FBI. He later went into films, with a number of starring roles, and did voice work for animated productions. His daughter, Efrem's granddaughter, Stephanie Zimbalist, has been a successful stage, film, and particularly television actress, noted for her role as a female detective in the series Remington Steele. Perhaps as a harkening back to her grandfather's sphere of activity, her stage roles have included productions about Chopin and Tchaikowsky. Thomas ("Tom") Burke (1890-1969) was an English tenor with a substantial recording career in both opera and popular song, beginning with English Columbia acoustic records in 1920 and continuing into the electric era for Columbia and various other labels. His stage credits include roles in the English premieres of Puccini's Gianni Schicchi and Il Tabarro. His wife, Marie Burke, was an early cinema actress, and their daughter, Patricia Burke, chose to follow primarily in her mother's footsteps rather than her father's. Her most celebrated film roles were in The Lisbon Story and The Trojan Brothers, and she had a successful career in television, including the starring role in Elizabeth of Ladymeade (1949) and several seasons of appearances in The Adventures of Robin Hood. From 1958 to 1972 she was in the cast of the English radio drama The Clitheroe Kid, and her credits also included roles in legitimate theater: Shakespeare and Shaw at the Old Vic and Aristophanes at the Royal Court Theater. The name Otto Klemperer (1865-1973) is likely to be more familiar to the general listening public today, because he lived to make stereo recordings, although his recording career actually began in the 1920s. An associate of Gustav Mahler and a first-rank figure among conductors during the inter-war and post-World War II periods, he fled the Nazi regime and settled in the United States, where his career was eventful, to say the least, including a period when newspaper stories circulated claiming he had become insane. His wife, Johanna Geisler, was a successful soprano in Germany, but their son, actor Werner Klemperer, may have been the best-known member of the family. Father Otto developed a reputation as an artist of unrelenting seriousness, but nothing could have been further from Werner's most famous role as Col. Klink on the television comedy series Hogan's Heroes, for which he received two Emmy awards and nominations in each of the series's six years. By then, he had already played parts in the award-winning 1961 film Judgment at Nuremberg and television dramas as diverse as Maverick, How to Marry a Millionaire, Perry Mason, The Untouchables, and one episode of Alfred Hitchcock Presents (earlier, he had appeared in Hitchcock's film The Wrong Man in an uncredited role). He would go on to appear on Broadway, including in a 1987 revival of Cabaret that netted him a nomination for the Tony Award, and in opera productions in San Francisco and at New York's Metropolitan Opera. Meanwhile, like Walter Slezak, he made an appearance on Batman, and continued his diverse television career with at least cameo appearances Lost in Space and Voyage to the Bottom of the Sea. Off stage, he spent years as an elected council member of the Actors' Equity Association, eventually serving as the union's vice president.